Meet BLUE DRAGON, our newest recruit, a heroin ready to fight against the fiercest enemies and win the hardest battles. She has the perfect combination of nerves of steel, sharp reflexes and a focused mind, making her the best fighter-pilot of the Federation. Blue Dragon gained her code name by fighting, she wears it with honor and pride. Growing up in a lonely home and confronting the world alone made her the person she is today. Blue Dragon pushed herself to achieve all her goals. She knows that one day she will discover her true heritage. In the meantime, Blue Dragon concentrates on training, fighting, and wholeheartedly defending her comrades-in-arms. 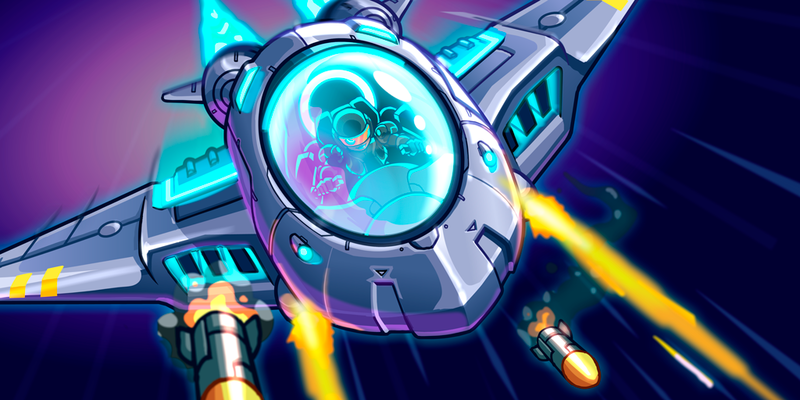 Blue Dragon’s fight style is unique, she enters the battlefield evading attacks and dodging enemies while launching a true barrage of bullets and deadly missiles. Her top-of-the-line starfighter has been equipped with the most devastating energy weapon in the entire fleet’s arsenal. Blue Dragon is assisted by her trusted friend and co-pilot, the cute and brave techbot, T-2.